One of the biggest concerns of pilots across the country right now is the slow decline of General Aviation. The average age of pilots across the nation is now about 49 years old. Has the magic gone out of flying? 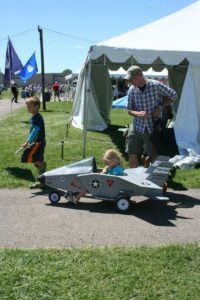 Anyone who has experienced the exhilaration of Oshkosh Air Venture would not think so, but the numbers nationwide paint a sad future. So why is this happening? A lot of reasons come to mind – the biggest one of which is simply that there are so many different ways that people can spend their money for personal thrills now. People feel they need expensive computers, TV’s, cars, Iphones – and the associated costs to use them. Communities offer their kids Little League, soccer, and many other activities which keep them busy. Unless a person has enough disposable income to buy and maintain an aircraft, they have limited access to the sport. Most young adults are investing in college or creating good homes for their own kids, whose needs also cost money. The closest thing to flying that the general public now engages in enthusiastically is drones. So how can we change the perception that flying is an expensive hobby for wealthy people? How do we bring the kids and their parents to airports? Aviation is an addiction that grabs best when discovered at a young age. The EAA knows this and uses the Young Eagles program to draw in kids everywhere. This idea needs to be expanded, but how? Let’s tackle the problem from different angles simultaneously. The first challenge is to make people comfortable with airports again. High security will still keep away most people unless they are using air carriers, and smaller community airports have been becoming more and more exclusive to the current pilot population. Most smaller airports are supported by the communities they serve. That is a LOT of land that is often kept completely isolated from any other activity and in many cases the user fees cause the property to be a financial drag. Why can’t they diversify? Yes, any activities must not hinder the safety of aircraft in and around the airport, but communities should be able to use these facilities to the advantage of their citizenry. Bringing people to the airport for any reason is one way of getting them comfortable with being there. Marrying community events with airport facilities also teaches participants the rules – where they can go or not go. It allows people to get close to aircraft. Some airports have are already engaged in these activities. There are aviation museums in Santa Theresa and Grants. Belen flies Santa Claus in for a Holiday event on the airfield. But there could be so much more. What if every small airport had a corner of the area where kids and adults could bring their drones and learn about the rules of flying them? What if a local non-profit could use a hanger for a fundraiser? How about giving a local school or scout troop some meeting space or activity space? Maybe work with the science teachers to bring the kids out and help build airplane parts? And have information available to people about the real costs of flying – starting with aircraft. Many small aircraft these days cost less than some cars, but the perception of the public is that every aircraft costs more than a house. Many of you reading this may have other ideas on ways to attract more people to the wonders of aviation…I ask you, no, challenge you, to send me your thoughts. Let’s examine how we can keep General Aviation alive and growing. ⟵Modernization vs Privatization? How are they connected?